A funny thing happened as I was finishing my last blog post about Google’s unconfirmed algorithm updates in 2015. I was getting ready to publish the post and the algo Richter scale in my office started to move – and move quickly. So I held off on publishing the post and waited for more data to come in. And I’m glad I did. It ended up we saw yet another significant unconfirmed algorithm update on November 19, 2015. And it was big. Really big. I included some information about the 11/19 update in my post, but knew I would be digging in much further as I analyzed more sites that were impacted. And the more I dug in, the more movement I saw. There were many sites surging or dropping starting on 11/19 and it was hard to overlook the connection to previous “quality updates” in 2015. For example, many sites that surged or dropped during the 11/19/15 update also saw significant movement during the 2/5/15 update, Phantom 2 in early May, and then the September updates (9/2 and 9/16). For those of you not familiar with Phantom 2, I ended up picking up a major algorithm update in early May of 2015. I named it Phantom based on its mysterious nature. It was a huge update that impacted many sites across the web. Google finally confirmed the update and said it was a change to its core ranking algorithm with how it assesses quality. Yes, that’s important to say the least. You can read more about Phantom in my post covering my findings and analysis. After Phantom 2 rolled out, I knew it would take a lot of work for sites to recover from a major hit. That’s because I had seen a similar update before in May of 2013 (which I called Phantom 1). It took months of remediation work before sites began to recover. I believe the first recovery was about 2.5 months after the update rolled out on 5/8/13. Since Phantom 2 was eerily similar to the original Phantom update, I believed that recovery from Phantom 2 would take a similar amount of time. And it seems I was right. The first signs of Phantom 2 recovery started during the September updates (9/2 and 9/16). I saw websites begin to jump during those updates that had been negatively impacted by Phantom 2 in May of 2015. And I also saw sites drop during the September updates that saw movement during Phantom 2 and the 2/5 update. That led me to believe there was a connection between those updates. You can read more about the September updates in my post covering both 9/2 and 9/16. The more sites I dug into that were impacted by the 11/19 update, the more connections I saw to previous quality updates like the 2/5 update, Phantom 2, and the September updates. To illustrate that point, let’s take a look at some screenshots from Searchmetrics. It’s crazy to see the connection to Phantom 2 in May of 2015, right? OK, so we know there was a major algorithm update on 11/19, but what else do we know about our Phantom-like friend? Well, based on my analysis over the past ten days, I do know some additional things. And they are important to note. The 11/19 update seemed to be connected to the appearance or removal of rich snippets in the SERPs. Between my own clients seeing this, and new companies reaching out to me about the situation, I know of several sites where rich snippets either disappeared (for sites negatively impacted), or reappeared (for sites seeing positive movement). If you’ve read my posts about algorithm updates before, then you know that Google can roll out a significant algorithm update and then refine the algo to ensure they are seeing the best results possible. I’ve called these smaller updates “tremors” and John Mueller confirmed that Google can (and will) roll out these smaller changes. Well, there is a lot of evidence that a tremor rolled out on 11/28 and many of the sites seeing impact on 11/19 saw more impact starting on 11/28. Some went up more, some fell further, while others adjusted (going up after going down or vice versa). Keep this in mind while analyzing your own trending. I had a number of companies reach out to me after the 11/19 update explaining that they just received a pure spam penalty (manual action). I found the timing of these manual actions very interesting. 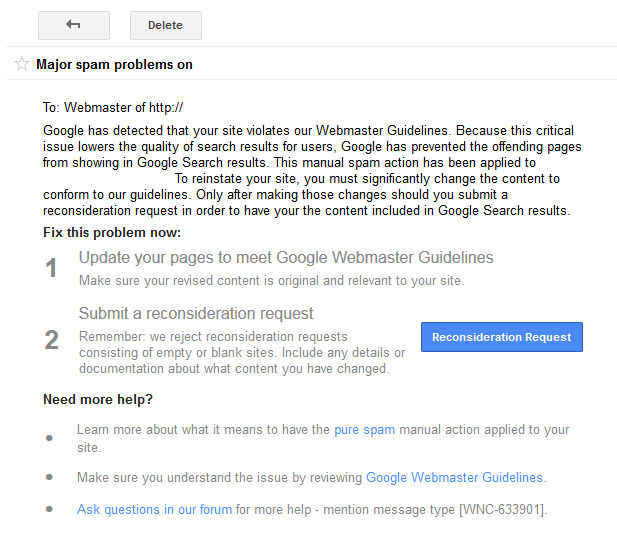 Here we have a major algorithm update targeting “quality” and at the same time Google dishes out a bunch of pure spam penalties. Coincidence? Seems like Google had a full-blast attack on low quality content, poor user engagement, etc. It’s something to keep in mind. In my post about the unconfirmed algorithm updates in 2015, I explained that the various quality updates could have been Google deconstructing Panda and baking those elements into the core ranking algorithm. As I’ve mentioned before many times, it seemed that Panda and Phantom both targeted very similar things. For example, I noticed many examples of content quality problems on sites pummeled by Phantom, when most people would associate those problems with Panda. But the more sites I analyzed that were impacted by the 2/5 update, Phantom 2 in May, and the 11/19 update, the more I started to realize the slight difference between the quality updates and Panda. And it came down to user engagement. I’ll cover more about the negative impact I saw from the 11/19 update below, but wanted to mention an overarching theme based on fresh hits. While viewing pages that dropped in rankings during the 11/19 update, and then the sites overall, it was hard to overlook the horrible user engagement problems riddling those websites. Time and time again, I was banging my head against my monitor in frustration. Sure, there were times low quality content reared its ugly head, but user engagement barriers seemed to be a major factor that tied all of the fresh hits together. So if that’s the case, then maybe Panda’s job is to focus more on “content quality” while Phantom and other quality updates focus on user engagement barriers. It’s important to cover this as we have two quality cowboys in town (Panda and Phantom). As I mentioned above, while analyzing sites that were negatively impacted by the 11/19 update, it was hard to overlook serious user engagement problems. In addition, deception reared its ugly head (just like it did during Phantom 2). For this post, I figured I would simply list some examples of problems I saw during my travels. This is by no means a final list of Phantom problems, but instead, a sampling of issues I believe can cause major problems with Google’s quality updates. I’ve mentioned this many times before in posts about Panda and Phantom. I saw ads that looked like content weaved into the page (into the primary content). The intent was clear… get as many people as possible to click the ads (even if they didn’t know they were ads). This included both display ads that matched the content and text ads that looked like it was either part of the content or navigation. I visited a number of sites that got hammered by the 11/19 update that employed a clunky and clumsy user interface for accessing content, traversing the site, etc. That included horrible infinite scroll implementations, overlays that were hard to maneuver, and other extremely frustrating ways to access more information. And by the way, I have two large flat screens working in tandem in my office… If I was frustrated, I can’t imagine what the average user thinks while working on one smaller screen. I hit many sites that displayed gigantic ads at the top of the page that pushed the primary content below the fold (even on my giant monitors). And I even saw a few examples of giant ads that let you choose additional ads to play at the top of the page. Oh how nice of them. :) It was so confusing and frustrating. Think about someone searching for a topic, trying to find an answer, etc., and then hitting a page that provides giant ads that force you to scroll heavily to find any semblance of content. Not good. But let’s not stop there, how about adding video to the advertisements and you’ve got the perfect storm of user frustration. I saw that several times as well. Forcing users to click through dozens of pages to view an article can cause serious user frustration. This is often done for monetization purposes, as each new component page can load more ads. Some sites I’ve helped with both Panda and Phantom problems were forcing users to click through 30 or more pages to view an article, with only a few paragraphs per page. A radical pagination change is typically a big move for many sites based on the drop in ad impressions from nuking the excessive pagination. But after getting smoked by Panda and/or Phantom, there’s usually not much of a choice. High quality supplementary content can be extremely valuable for users. But low quality supplementary content can negatively impact the user experience and perception of the site. And if the supplementary content is completely disorganized, then it might not even matter how high quality it is… I saw some pages that seemed to throw supplementary content all over the page. It was very 1997-like. For example, scattered links, thumbnails, and lists in the right sidebar, left sidebar, and all around the primary content. It looked thrown together… Needless to say, it’s frustrating for users to traverse a page like that, they could mistakenly click the wrong link (or several), and the credibility of the site in question drops quickly. Choose supplementary content wisely. Think about users first and monetization second. Another annoying issue I saw across sites impacted by the 11/19 update involved the triggering of popups or modal windows as you scrolled down the page. Some prompted you to like the page on Facebook while others asked for email addresses. And some sites mixed that with infinite scroll. Talk about annoying and frustrating. Imagine scrolling down a page through numerous articles, which then freezes to reveal a popup asking you to like a page on Facebook. Then you need to take action to close that popup, only to get back to a clumsy infinite scroll. I had to force myself to stay on those sites to analyze more of the impact. I really wanted to bolt… And that’s the core problem. I’m sure many others feel the same way. So, if you’re Google and you pick up on those horrible signals, would you still drive traffic there? No freaking way. I’ll stop here, but I hope this sampling of user engagement problems helps you better understand what the 11/19 update targeted (and previous updates like 2/5 and Phantom as well). You’ll notice a number of the problems listed above are tied to advertising and monetization. I’ve seen this many times in my both my Panda and Phantom travels. 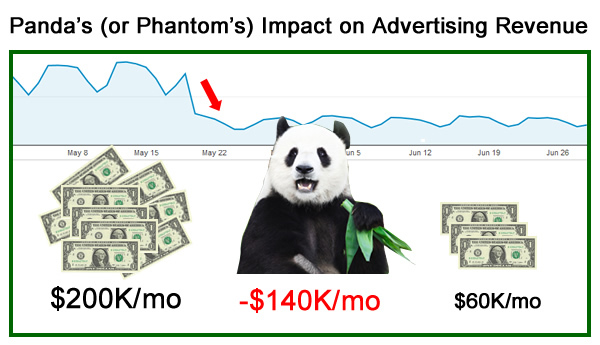 You can read more about the impact of aggressive advertising on Panda in my Search Engine Watch column. And this problem definitely looks tied to Phantom as well. In a nutshell, don’t destroy your organic search traffic by pushing the envelope from a monetization standpoint. It won’t end well. Beware. Now that I’ve covered a number of the user engagement problems riddling websites that were negatively impacted by the 11/19 update, let’s focus on the positive. As mentioned earlier, many sites that have been working hard to recover from Phantom 2 in May surged during the 11/19 update. Based on helping a number of companies with Phantom 2 hits, I’ll explain some of the actions they took after getting smoked. First, review the list of negative factors above and reverse them. Seriously, although it’s just a sample of user engagement problems, it’s a healthy list to review (and has been tackled by a number of companies I’m helping with Phantom 2 hits). But to reinforce those points, here are some major items addressed by companies seeing recovery during the 11/19 update. You’ll see a lot of overlap with negative list above. As I explained earlier, ads should be clearly labeled as ads. And they should not be weaved into the content. And they should not be cloaked as content (similar color scheme, layout, etc.) Don’t trick users into clicking ads. And this applies to affiliate links as well. Hell hath no fury like a user scorned. From clunky navigation to crazy infinite scroll implementations to popups and modal windows, be very careful with UX. If you frustrate users, Google will know about it. Removing user engagement barriers like this is critically important. Make it easy for users. Don’t let monetization get in the way of letting users find what they need. And don’t make traversing your website more like a warped game of whack-a-mole. 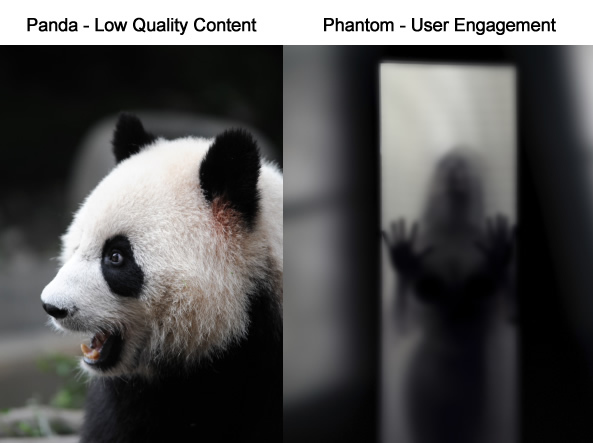 Hunting down thin and low quality content is extremely important from both a Panda and Phantom standpoint. If users searched for a solution, clicked through a search result, and found a thin piece of content that didn’t meet expectations, then that can send horrible signals back to the mothership. Once you surface thin and low quality content, you need to either nuke it or boost it. Some clients I’ve helped had hundreds of thousands of pages of thin content (or more). You need to tip the scales in the right direction. I mentioned earlier that some companies try to force users through many pages of pagination to read an article (for monetization purposes). Well, a number of companies I’ve helped with that problem changed their setup to reduce the amount of pagination, or completely nuked that tactic. The change resulted in higher quality content on one page plus happy users. In addition, some decided to keep the pagination, but provided a “view-all” page (and used the proper SEO setup to ensure the view-all is surfaced in the SERPs). Google’s Quality Rating Guidelines mention content categorized as “your money or your life” or YMYL. These are pages that “impact the future happiness, health, or wealth of users”. For YMYL content, it’s important to know the author or source of the information. By doing so, you can build credibility and ensure users know the content is written by an experienced author (doctor, lawyer, industry expert, etc.) I recommend avoiding content written by “Author” or “Admin” or “Anonymous”. Instead, provide the actual author. Here is information from Google’s Quality Rating Guidelines about Expertise, Authoritativeness, and Trust (E-A-T) and YMYL content. When someone searches for a solution or answer, and then clicks through a search result, it’s critically important that they find a solid piece of content that meets (or exceeds) their expectations. There are many times that webmasters are too close to their own content to be objective. If you can’t meet or exceed user expectations, then maybe the content shouldn’t be on your site in the first place. It’s a tedious process to enhance a lot of content on a website, especially on larger sites, but it can help improve the experience for users. Unfortunately, many still don’t know that you can use fetch and render in Google Search Console to truly understand how Google views your pages. You might be blocking important resources that help Google accurately render the page. 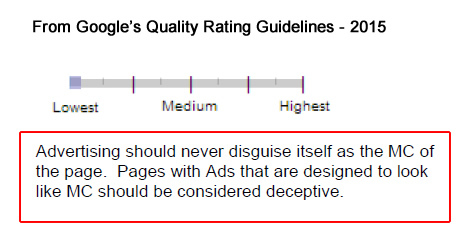 And if Google cannot accurately render your page, then it might not be seeing everything it should see. In addition, there could be ads or content rendering in very strange ways. For example, I tested one site using fetch and render that revealed giant ads on top of their primary content. There was a technical problem causing that to happen. 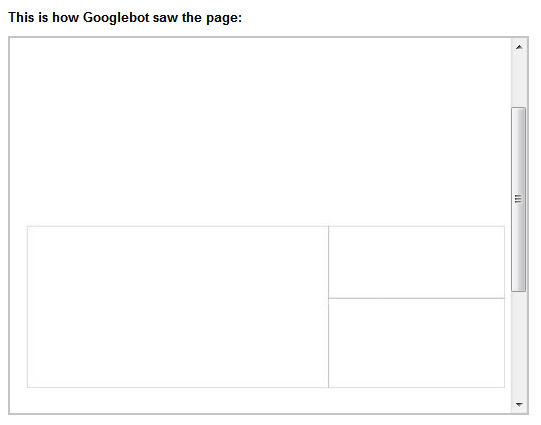 It was invisible to the naked eye, but Googlebot was seeing it. Not good. Fetch and render is your friend. Use it. 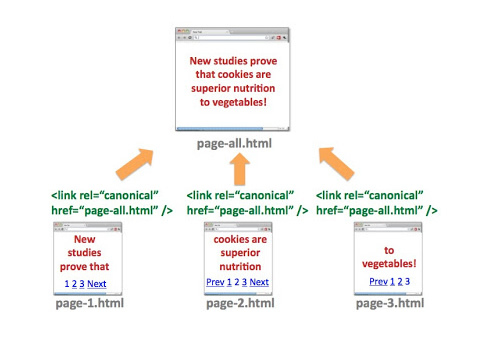 Below is an example of Googlebot running into major problems rendering content on a page. Run, don’t walk, to GSC to use fetch and render. You never know what you are going to find. I know of several sites that saw partial recovery during the 11/19 update that weren’t handling their mobile urls correctly. 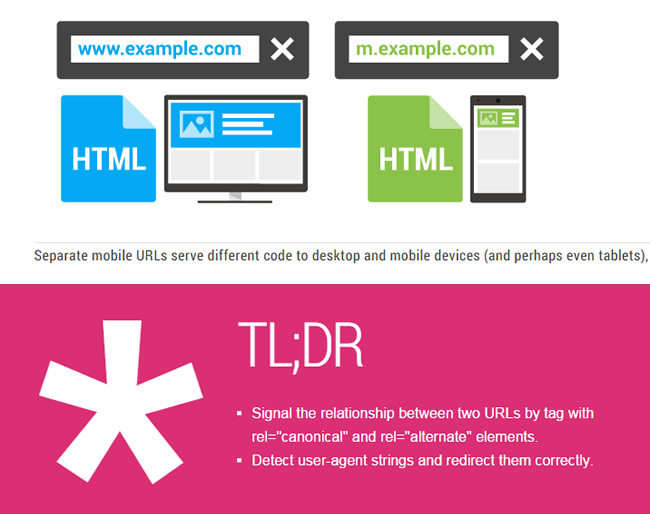 For example, they did not connect the desktop version of the url to the mobile version based on Google’s recommendations. That means using rel=alternate on the desktop version pointing to the mobile version, and then rel canonical on the mobile version pointing to the desktop version. Once those changes were implemented, Google could correctly associate the mobile version with the desktop version (and all that goes along with it from a rankings perspective). I mentioned earlier that low quality and disorganized supplementary content can be problematic. For example, irrelevant secondary content around (or weaved into) the primary content. On the flip side, providing high quality supplementary content in an organized fashion can actually enhance the user experience. Don’t throw a boatload of “related links” all over the page. And make sure users know when they will be leaving your site (downstream to a third party website). Always think about supplementary content from a user’s perspective and not purely from a monetization perspective. That will usually lead you down the right path. Again, these were just some examples of what sites did to help fix their Phantom 2 problems. Each site is different and a thorough crawl analysis and audit can help surface important problems. After analyzing many sites impacted by Google’s quality updates in 2015 (including the 11/19 update), I believe Phantom is basically looking out for users. I have yet to find one site negatively impacted by Phantom 2 or the 11/19 update that didn’t have some type of user engagement problem (and many had several problems). Be objective when reviewing your own site. That’s the only way to make the necessary changes that can lead to recovery or partial recovery. If you were impacted by the 11/19 update, then you should perform a deep crawl analysis and manual audit of your website (and analyze the site through the lens of Phantom). By doing so, you can surface key user engagement problems that could have caused a drop in rankings. Also, and this is important to note, your site will probably not recovery quickly. That’s because Google will need to time to process all of the changes you implement (and re-measure user engagement). And of course you need to first audit your entire site (which can take a while depending on the size and complexity of the site at hand.) 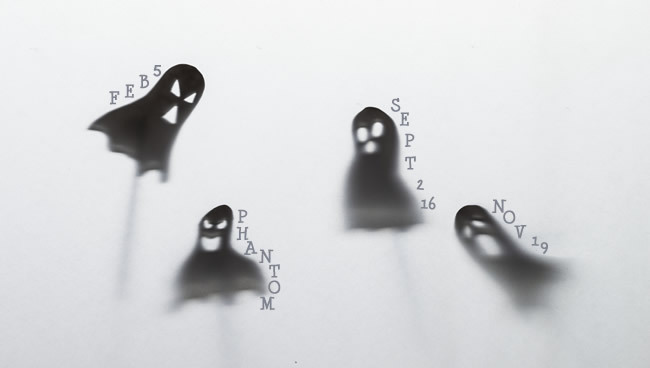 Think about what happened with Phantom 1 in 2013 and Phantom 2 in May 2015. It took sites multiple months to see recovery after performing a ton of remediation work. Unfortunately, it’s not a quick process. So, it looks like we had four major quality updates in 2015 (2/5, Phantom 2 in May, The September Updates, and then 11/19). And I expect more quality updates to roll out in 2016 (plus a revamped Panda – which will possibly be real-time). The good news is that you can start analyzing your site today and then form a plan of attack. With the right changes, sites negatively impacted by the 11/19 update can see recovery during future quality updates. But again, that might takes months of hard work. Good luck.